Contrary to what you might think, a knocked out tooth doesn’t inevitably mean tooth loss. Time is of the essence — the shorter the interval between injury and replanting the tooth, the better the tooth’s long-term survival. The longer the interval, on the other hand, the less likely the tooth can survive beyond a few years. That phenomenon is due to the mouth’s natural mechanism for holding teeth in place. The tooth root maintains its attachment with the jaw bone through an intermediary tissue known as the periodontal ligament. Tiny fibers from one side of the ligament securely attach to the tooth root, while similar fibers attach to the bone on the opposite side of the ligament. This maintains stability between the teeth and bone while still allowing incremental tooth movement in response to mouth changes like tooth wear. While the ligament fibers will attempt to reattach to a replanted tooth’s root, the longer the tooth is out of the socket the less likely the fibers will fully reattach. An “ankylosis” may instead form, in which the root attaches directly to the jaw bone without the periodontal ligament. In this situation the body no longer “recognizes” the tooth and begins to treat it like a foreign substance. In all but the rarest cases, the tooth root will begin to resorb (dissolve); at some point (which varies from patient to patient) the attachment becomes too weak for the tooth to remain in place and is lost. 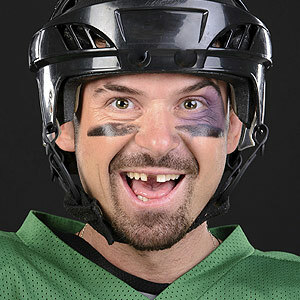 Ideally, a knocked out tooth should be replanted within 5 minutes of the injury (for step-by-step instructions, refer to The Field-Side Guide to Dental Injuries available on-line at www.deardoctor.com/dental-injuries). Even if you pass the 5-minute window, however, it’s still advisable to attempt replanting. With a subsequent root canal treatment (to remove dead tissue from the inner tooth pulp and seal it from infection), it’s possible the tooth can survive for at least a few years, plenty of time to plan for a dental implant or similar tooth replacement.